Just as every site speaks only about his poetry. Pages from a Physician’s Diary. Rouben was a physician by training just as he was master literarian, I cannot find any of his entries into his diary. Every time I read Daniel Varuzhan’s Hivand E I remember Ruben’s descriptions of the tragic stories of the poor migrants. He writes about his attendance to a tuberculosis victim, where he describes the breath of the victim reminiscent of a “freshly slaughtered chicken”. In another he vividly describes the condition of an emigrant who had been sleeping over cattle dung, suffering from Tetanus infecton, with all its details of muscular and nervous contortions. Thank you for the biography of Rouben Sevak. But if you can find some prose from him, I should be very happy to read it, as I have only his poems. Sad to say, I don't have it. What I remember is form long ago at school. I wonder if Johannes has access to it. Below we will see a detailed biography and learn the origin of his penname/գրչանուն/nom de plume . He was born with name of Yeghisheh Soghomonian. Some say he copied it from Pushkin’s poem “Änchar” with juxtaposition of lrtters. Others say that it was since he was a naughty/char) boy. See his intimation to Mahari, where he says he copied the name from the shingle of a local doctor by the name of Charents. At the end you will see that his autopsy revealed multiple (unnamed) health issues. Others argue that he was a victim of the stalinian purge. The reason why we need an unedited version of the “archives”. We will follow up. Edited by Arpa, 16 June 2009 - 10:23 AM. Moi aussi. Je veu savoir plus. Johannes has been silent for quite sometime. I may understand why. He, like me is not interested in sirousho/vorousho/ euro/voro/vision either. Pages torn of a Physician’s Diary ? As indicated above, with all due respects to his lyrical talent, even if at times he may even touch on the misery of the day to day life of the immigrants, my most indelible memory of him is when we, at the Armenian classes read excerpts from his book above, “A Physician’s Diary”. I do dimly remember two of them, the ones about Tetanus and TB. What else is there in that book? How about you translate it? It will not only speak about the miseries of the time, it will also be a commentary about the state of “modern” medicine as it was. It may also be a “textbook” for the practitioners and students of medical sciences. PS. Now that there is so much talk about DR-TB, drug resistant tuberculosis. Sorry! Too graphic! At the time we did not know what he was talking about. ** Armenian sources call this condition Ատամնաւոր Տետանուս/ Կծկում, i.e “ spasm of the teeth/jaw”. Is that what the Bible is talking about? Edited by Arpa, 25 March 2010 - 09:45 AM. I'm not in Yerevan right now, but I'll be back in a few days. What do you need? With a bit of luck, I might be able to find the book at Vernissage. Good luck at the vernissage. I say that because during my last visit the book section at the flea market was not anything near it was during my first visit, nothing of interest for me, like used childrens picture books or comics. No Nairi. It it is not poetry. We know all bout them. It is PROSE, perhaps with some poetic license. *Though not poetry in the tradiditional sense, it may be best described as "lyrical prose" that only a poet can. The scenes are described with such poetic precision, it is as if one is watching a movie. Edited by Arpa, 28 March 2010 - 08:47 AM. Good luck at the vernissage. I say that because during my last visit the book section at the flea market was not anything near it was during my first visit, nothing of interest for me, like used childrens’ picture books or comics. As I mentioned before many here are familiar with your excellent commentaries, many are avid readers and followers, your works have been quoted here under a variety of topics. Please write more often and regale and educate us with your excellent articles. As to R. Sevak’s prose novellas, I wish I could help but I am not a cyber-geek, we have many here who can help, the most expert of them being our fearless commander in chief, our Administrator Garo, I am sure he can scan and even convert them to HTML format. If he agrees you can mail him copies of the said literature.. I am keenly interested, as I can only vaguely remember the details that I have read many years ago at middle school. Those “diaries” are not only literary gems they are also a good “picture” of the society of the time, even with historical value. Edited by Arpa, 22 April 2010 - 03:49 AM. Can you guys see the scripts below? Please click on the right or left arrows to see the particular articles. **Did Napoleon suffer of that disease? Many who pretend to be him do. OK! All you HOUSE TECH-GEEKS! How about converting the above site to a readable and quotable version? PS. In Ruben Sevak’s biography we read that he was born in a relatively prosperous family of Hovannes Chilingirian, an ironsmith at first, then a merchant of ironware, who saw that his children get the best of available education, so much so that he even supported Ruben during his medical training in Lausanne., and that Ruben chose his penname Sevak (black/dark-eyed) because of his rather dark skin complexion and black eyes. It is curious that my mother’s uncle (kerayr) by marriage who was murdered in 1915 was also known as Hovannes Chilingirian. Although in the biography it is intimated that the family were ironsmiths, to see what “chilingir” really means we will go to Language. Edited by Arpa, 08 November 2010 - 09:58 AM. 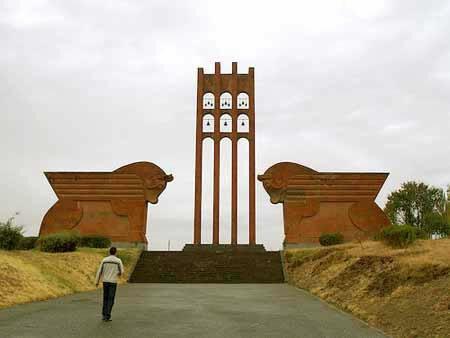 PanARMENIAN.Net - Dr. James Russell, Mashtots Professor of Armenian Studies at Harvard University, will present a program on "The Bells: From Poe to Sardarabad" on Thursday evening, December 15, 2011 at the Armenian Library and Museum of America. Church bells are deeply symbolic, and of all musical instruments may come closest to language. Edgar Allan Poe's great final poem "The Bells" is language that comes closest to music. Later the Armenian poet Ruben Sevak, in Lausanne, wrote a poem, "Bells, Bells!" in reaction to the Adana massacre; and it echoes in the hidden, unpublished poems of Yeghishe Charents, who was fascinated by Poe, ALMA said in a press release. Finally Paruyr Sevak rings the bells again in his epic poem Anlreli zangakatun ("The Unsilenced Bell Tower"), changing the tone of their chiming from the clangor of disaster to the ringing of survival, defiance, and victory. Գույժ տվեք վաղվան, զի հասկը մեռավ. Կախվիլ ու ցնցել երկաթ բազուկով. Edited by Arpa, 03 December 2011 - 10:08 AM. I had been looking for a detailed biography of Ruben. In particular for his collection of novellas known as PAGES FROM A PHYSICIAN“S BOOOK**. Some of which I remember vaguely. See GROONG below. Next I will attempt to post it in full in Armenian. Observe above how how he and his soul mate Daniel Varuzhan were savagely murdered. They were both thirty years young. ** In that book many of the stories are about migrant workers from the interiors, much reminiscent of Grigor Zohrab. In the novella GROONG he talks about a student who, having completed his studies in Europe, ends up dying in a Geneva hotel of tuberculosis, while his old parents wait for his return with joyful anticipation, whose only last wish is to hear the song GROONG. Don’t be ashamed If reading that story you cry. Join me. Edited by Arpa, 17 February 2013 - 09:06 AM. Խակայն, յանկարծ, մութ անկիւնէ մը, դողդոջ ու ցած երգ մը սկսաւ, նախ մէկ բերնով, յետոյ՝ բոլոր շրթունքներէն, բարի ու ահաւո՜ր երգ մը, որ սառը կոտրեց, արցունքները հալեցուց, սրտերը տաքցուց, բոլոր հոգիները, բոլո՛ր հոգերը, բոլո՛ր տրտունջքները, բոլո՛ր մրմունջները իրարու միացուց. Edited by Arpa, 17 February 2013 - 09:40 AM. I found another gem of Ruben&#146;s &#147;Pages from a Physician&#146;s Diary&#148;. Aylaseroum. Even if it is a diversion from his medico-scientific style. My first instinct was that he was talking about ethno-racial assimilation and alienation. Turns out it is not that farfetched. He is talking about the so called half baked intellectuals of the time, and their style of educating of our youth, where he invokes the clich&eacute; -&#147; The Fish begins to smell at the Head&#147;. **Please see above how both Ruben and his soul mate and friend Daniel, both thirty years old .were tied to a tree axed and hacked to death. Still my wish is that someone would convert the above PDF to a legible text. Edited by Arpa, 24 February 2013 - 11:28 AM. Edited by Arpa, 24 February 2013 - 11:55 AM.